A couple weeks ago I decorated some Fig Newtons to look like Bibles/Books and placed them on top of cupcakes as a snack for my Little Flowers Girl's Club. 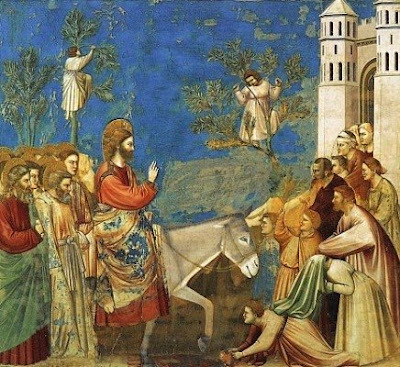 Those little cookies got me thinking about Palm Sunday (Palm Sunday is also known as Fig Sunday since tradition says that Jesus ate figs after entering Jerusalem.) and planning the following dessert to serve my family. Place a scoop (or two) of ice cream in each serving dish. Drizzle syrup over the ice cream. Place a small dollop of whipped cream over each scoop and top with a cherry. Serve with Decorated Fig Newtons. Here is a picture of the "Palm Sundaes" made by Sara at A Shower of Roses. I love the Palm Frond Cookies she cut out to go with the Sundaes! I'm having a serious case of "ask and you shall receive" moment. We're going up to the mountains this weekend and I wanted something special to to make for the family on Palm Sunday. Lo and behold Catholic Cuisine came to the rescue. I love these! I can't have wheat but our local health store has wheat free rasberry newtons I can substitute. Our priest is coming for supper on Friday and these will be my dessert! Thank you for all of the wonderful recipes and inspiration found here!! Great idea! This will be our special dessert on Palm Sunday! Great idea, we'll have to do this too, only hubby can't stand coconut! Great idea! A lot easier than trying to find passion fruit:) I thought using green fruit roll ups for palm branches would be a cute addition as well. we used these http://bahlsen.us/butter-leaves.php -- thanks for the idea! Other uses for those St. Nicholas Cookie Cutters!